Last time I was in Europe, I really wanted to bike in Spain. Well, I had the perfect chance while I spent a couple of weeks exploring the beautiful region of Costa Brava. Through a local contact, I was lucky to get in touch with Toni Segura, a passionate cyclist with an adventurous soul; who runs Sappysport, a bike rental and touring company. He agreed to take me on a day excursion around the area. On a bright Sunday morning, he picked me up at the hotel where I was staying and after exchanging the usual formalities he proposed three itineraries. Since I’d never cycled in the area, I didn’t know which one would be the best. I told him I just wanted a route with nice nature and a bit challenging, I’m not into leisure riding. As we drove, he was making all kinds of questions about my experience. So I told him about how much fun I had in Canada mountain biking in Squamish and how much I loved getting around by bike on the hills of Sintra in Portugal. 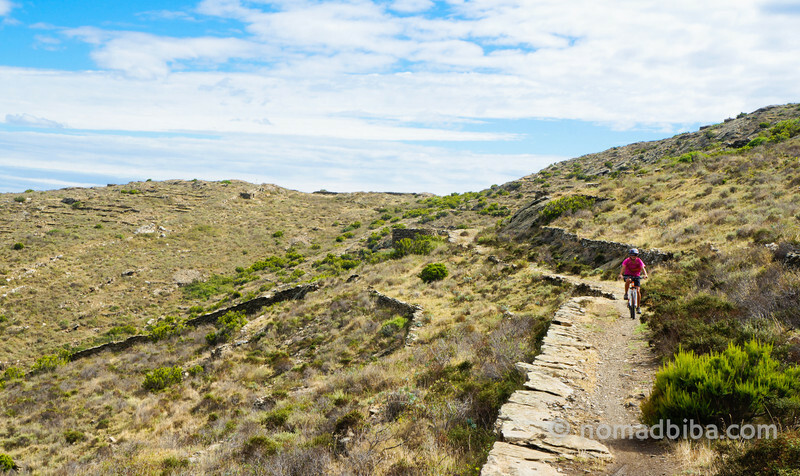 He seemed satisfied with that and said he knew a nice way around the Cap de Creus Natural Park. I was beyond thrilled, as I’d always wanted to spend more time in the park and this seemed to be the perfect place to bike in Spain. The start of the trail was at the top of a hill, there were a couple of climbs but nothing too steep. Then, as we started going downwards to the sea, the trail got narrower and rockier; it was beautiful with all the native bushes flanking it. However, at some points it was too steep for me and my self-preservation instinct kicked in; since I wasn’t wearing any protection besides a helmet, I was afraid of having the pedals encrusted into my shins (it has happened before). So I decided to walk down on the trickier parts; I’ve done some downhill riding, but sometimes it makes me nervous. Besides, riding on tree roots is one thing; riding on loose rocks is something quite different! Little by little we made our way down to the beach, a small bay with the clearest blue water; but since it was almost October, there was no one around except for a guy who was fishing. The landscape, particularly the trippy rock formations, was fascinating; no wonder Dali found inspiration in this area. Since it was getting windier, we didn’t stay long; but the way up was steep and hard enough to keep us warm. After the end of the steep climb from the beach, the trail became almost flat although it was still kind of narrow. Since I was feeling more comfortable in this stretch, I started riding faster. But right after a tight bend, my front wheel slipped after rolling over a rock and I went flying off the bike and over the trail towards the cliff. Luckily, I landed on top of a very flimsy tree that amazingly was sturdy enough to hold my weight; thus avoiding a pretty nasty fall to the void. It was also fortunate that Toni was riding behind me, so he was quick to give me a hand and helped me get back up. Once I saw that I had just avoided any serious injury and that I only had a few scratches, I burst out laughing. Now I wish I had a photo of me tangled in that tree, it was kind of funny. After, I kept telling Toni that he should have taken the photo before helping me up! Anyway, here’s a shot of some of the scratches I got. In the end, I had an awesome day riding out along the beautiful coast of the Cap de Creus Natural Park; it was great place to bike in Spain. The ride was all I could have hoped for and those scratches were just a reminder of how lucky I sometimes am ;) If you’d like to see more photos about my time in Costa Brava, you can visit my gallery. Wow, you’re so lucky that tree was there! You got off easy with just a few scratches. Take care! Yes, Freya! When I saw just how bad it could have been, I couldn’t believe my luck :) Thanks for stopping by! Wow, what a hilly, craggy side and glad you’re ok! Thanks, Charu! It was kind of scary :s I was really relieved when I realised I hadn’t fall to the void! Great adventure you had there, complete with the “battle scars”. The terrain that you’ve crossed looked very tough. I also like biking around the places that I go to whenever I get the chance. I am not a professional and to do what you did in Costa Brava would require great deal of stamina. Keep on biking!